The North Valley Trail runs for 3.5 miles south of McCall from River Ranch out to Heinrich Lane. The trail is open to walking, running, biking and horseback riding in the summer. Here’s a detailed description for a 10.5-mile bike ride from downtown McCall out to the southern end of the North Valley Trail and back. Caution: Mountain bikers should yield to hikers, runners and horseback riders on the trail. Getting there: Take Idaho 55 to McCall. Proceed into the downtown area, and turn west on Park Street. Go a couple blocks and park in a public lot behind McCall City Hall. The city greenbelt starts here. The Ride: The North Valley Rail-Trail is a perfect beginner ride for families, kids and individuals who are looking for a low-key scenic ride. Thanks to Valley County Pathways for developing the trail south of River Ranch, and thanks to River Ranch, Idaho Power Co. and Lake Irrigation District for providing public access to the rail-trail. To begin, ride south on the McCall Greenbelt to the McCall Airport. You’ll follow a bypass on Mission Street and head south to a paved trail provided by River Ranch parallel to Mission Street. At the end of the paved trail, follow signs to the North Valley Trail. Now the trail turns to dirt. Use caution when you cross Moonridge Drive. Continue south on the trail. The trail tread is mostly singletrack here, and double-track in a few places farther south. The trail runs south to a temporary end at Heinrich Lane. From here, you can take dirt roads to Lake Fork and ride on the paved Farm to Market back to McCall if you wish, as a longer option. 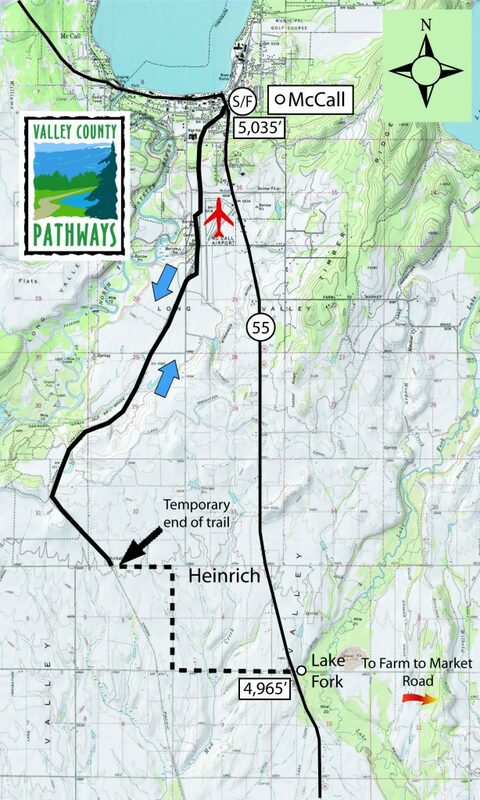 Otherwise, turn around at Heinrich and head back to the trailhead and public parking area where you started. Interpretive notes: Most of the North Valley Rail-Trail follows the route of the old Union Pacific RR Line, which was retired in 1979, when the McCall sawmill ceased operations. South of Moonridge Drive on the rail-trail, there is a beautiful pond that you’ll ride by. Watch for bird life. You also may see hawks, ospreys, herons and eagles flying overhead. If you are bringing your dog with you on the North Valley Trail, be sure to leash your dog by the wetlands pond, and keep your dog from swimming in the pond and spooking wildlife.